An evening with a breeze or a festive outfit with bare shoulders, let this supersoft shrug drape around your back to keep you warm all night. 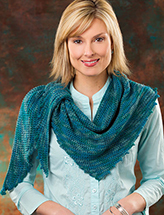 Knit with 1 (1, 1, 2, 2) skein(s) #4 worsted-weight Premier Yarns Deborah Norville Alpaca Dance using U.S. sizes 8/5mm straight and 32" circular needles and 10/6mm 32" circular needles. Across back: 16 (17, 18, 19, 20)"